This two-stop positive organ is an American instrument inspired by early Italian sources. The case is mahogany, loosely inspired by the design of a 1689 instrument in the National Museum of Musical Instruments in Rome. All pipework is wood, made from mahogany, poplar, and Alaskan yellow cedar. The keyboard naturals are yellowheart and the sharps are African blackwood. 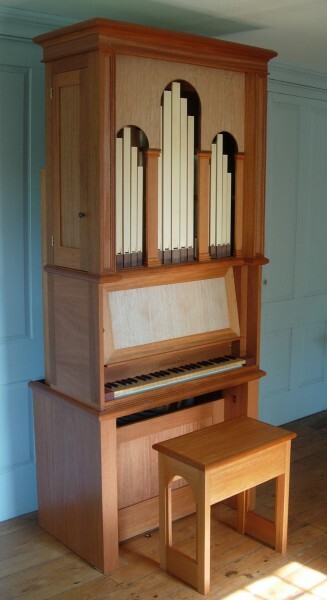 The instrument is in two detachable parts: the upper part contains the keyboards, windchest, and most of the pipework; the lower part acts as the base and contains blower, regulator, and the bottom octave of the 8’. These pipes stand behind the upper case and are visible from the side. The pipes inside the case can be tuned easily via the access doors on either side of the case. Extremely unusual for small organs being built today, the foundation rank is a warm, Italian-style principal (open from tenor F) which provides a significantly richer harmonic color than the more commonly used gedeckt. The 4’ provides a flute color for use on its own or in combination with the 8’. The keys are suspended directly from the pallets, and the action is light and extremely responsive.